Experience the care of Italian Heritage first hand and hands-on. The Sibyllam Project is an initiative conceived by Studio Carolina Izzo, in close collaboration with the Museums and Heritage Studies programme at Victoria University of wellington and the Italian Ministry of National Heritage and Cultural Activities. Take your knowledge to the next level of experience in Italy. The objective of the field school is to learn about different ways of preserving, conserving and displaying heritage objects. You will study how professionals in the museum sector interact with works of historical importance. 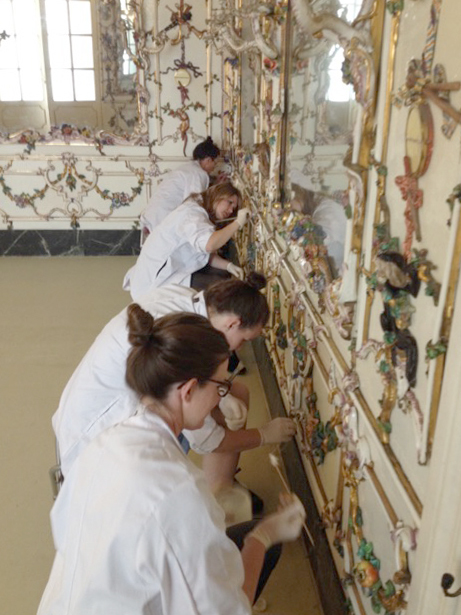 The tour is aimed at providing conservators, registrars, collection managers, museum curators, architects and selected students with specialist training in preventive conservation from theory to practice. It will be of interest to a range of participants at different levels; from experienced conservators and museum staff to students with little prior experience. The primary location of the Field School will be the Capodimonte Museum in Naples with site visits in Florence, Italy. Under the direction of Carolina Izzo and the guidance of selected Italian experts, participants will have a unique professional experience in the home of conservation. – Tour fee: NZ$6,200 twin share, NZ$6,500 single (Fee excludes return airfare to Naples, Italy. These prices are approximate only at this stage and may be subject to change). – There are places left in the 2016 Field School. Places must be secured by with a non-refundable $1000 deposit.